The practice of slaughter without pre-stunning can cause suffering to millions of farm animals. Current law requires animals to be stunned before slaughter - rendering them insensible to pain until death supervenes. However, exemptions are allowed that permit non-stun slaughter for religious purposes, i.e. Muslim and Jewish communities. We acknowledge that religious beliefs and practices should be respected. However, all animals should be treated humanely at the time of killing and therefore be stunned prior to slaughter. There doesn't need to be a ban on the meat that is important to some religious communities to ensure animal welfare is considered. 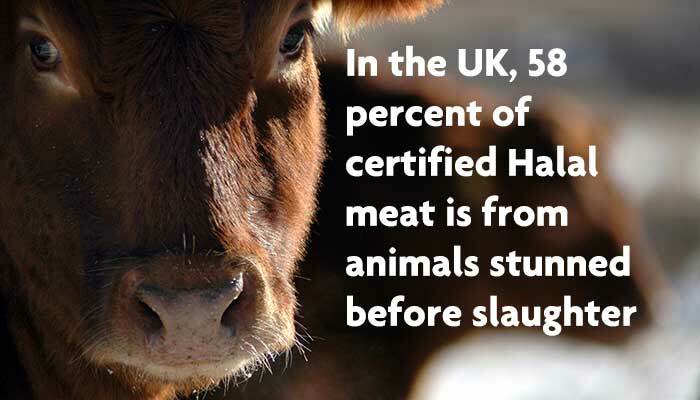 In the UK, 65 percent of Halal meat comes from animals which have been stunned before slaughter and certified Halal, highlighting that stunning and slaughter for religious purposes can work together. Together with British Veterinary Association (BVA) we're calling on the UK Government to end non-stun slaughter. No exceptions. If you live in Wales help us call on the Welsh Government to end the exemptions which allow farmed animals to continue to be slaughtered without pre-stunning. Information about farm animal slaughter and our work to try to improve animal welfare at this time. We're still waiting on figures promised by Autumn 2018.